Manfred Posani Löwenstein received his Ph.D. from the Scuola Normale Superiore di Pisa in 2015 with a thesis on the concept of the unconscious in the historiography of Jacob Burckhardt. His area of specialization includes Modern Philosophy, XIXth Century Anthropology and Historiography, Metaphysics, Historical Epistemology, German Modern Philosophy (Kant, Hegel, Nietzsche) and Theories of Culture (E.B. Tylor, Burckhardt, Warburg, Freud). His area of competence includes Aesthetics and Political Philosophy. He is currently working on both the French and Italian critical editions of Nietzsche’s philological writings (Les Belles Lettres, Adelphi). At the IRTG Diversity he will investigate the reactions raised by the false report of the burning of the Louvre during the Paris Commune (1871). PhD, Scuola Normale Superiore di Pisa, Italy; dissertation on: “The Unconscious Sign. Materials for the history of a fragment”. MA in Philosophy, Faculty of Arts, Department of Philosophy, Scuola Normale Superiore di Pisa, Italy; thesis on: “From Intellect to Essence. The Position of Reflection in Hegel’s Philosophy”. BA in Philosophy, Faculty of Arts, Department of Philosophy, Scuola Normale Superiore di Pisa, Italy; thesis on: “Translation, Introduction and notes to Friedrich Nietzsche, ‘The Divine Cult of the Greeks’”. PostDoc Fellow at the Université de Montréal (IRTG Diversity). Chercheur invité at the Université de Montréal (IRTG Diversity). Research Fellow of the Italian Academy for Advanced Studies in America, Columbia University, U.S.A.: “Louvre on Fire. History of a false Report”. (Fellowship awarded in April 2016). 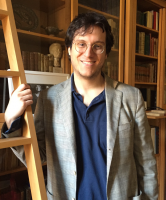 Research Fellow of the Scuola Normale Superiore di Pisa, Italy: “The Concept of Event in Jacob Burckhardt”. Edition and Italian translation of Jacob Burckhardt’s Text: “French Literature and Money”. Fellow at the STAABI Berlin for the edition of Nietzsches lessons on “The Divine Cult of the Greeks”, Berlin, Germany. Erasmus Fellow at the Freie Universität Berlin, Germany. Fellow at the Albert-Ludwigs-Universität, Freiburg im Brelau, Germany. PostDoc fellowship at the Université de Montréal (IRTG Diversity). Research fellowship of the Italian Academy for Advanced Studies in America, Columbia University, U.S.A.: “Louvre on Fire. History of a false Report”. (Fellowship awarded in April 2016). Research fellowship of the Scuola Normale Superiore di Pisa, Italy: “The Concept of Event in Jacob Burckhardt”. Edition and Italian translation of Jacob Burckhardt’s Text: “French Literature and Money”. Fellowship (awarded from the Scuola Normale di Pisa) at the STAABI Berlin for the edition of Nietzsches lessons on “The Divine Cult of the Greeks”, Berlin, Germany. F. Barone Prize for the best MA dissertation in philosophy at the University of Pisa, Italy. Erasmus Fellowhship at the Freie Universität Berlin, Germany. Fellowship at the Albert-Ludwigs-Universität, Freiburg im Brelau, Germany. “Jacob Burckhardt and the Burning of the Louvre”, Proceedings of the Conference: “Truth, Lies, and Manufacturing Memory”, Humber College, Toronto: October 28-29, 2016. (ed.) Friedrich Nietzsche, Le culte divin des Grecs (Paris: Les Belles Lettres). Burckhardt e Nietzsche. Cinque Studi, (Pisa: Edizioni della Scuola Normale di Pisa). “Dialectics and Interpretation in Hegel’s Philosophy of Art. Some Preliminary Remarks”, Hegel gegen Hegel II. Hegel-Jahrbuch 2015, 44-49. (ed.) Friedrich Nietzsche, Il servizio divino dei Greci (Milano: Adelphi Milano). “Le astuzie del moralista. Ragion di stato e analisi psicologica fra 500’ e 600’”, Rinascimento 50, 2010, 451-476. "Mettre en scène la politique. Brecht et Wagner aujourd’hui", in: Laurence McFalls/Mariella Pandolfi (eds. ), Politique et Musique (Montréal: Boreal). “‘Ottimismo del temperamento’ e ‘nichilismo’”, in: Prospettive. Omaggio a Giuliano Campioni (Pisa: ETS). "F. Nietzsche", in: Giordano Bruno. Parole, concetti, immagini (Pisa: Edizioni della Scuola Normale Pisa).